DENVER, Apr. 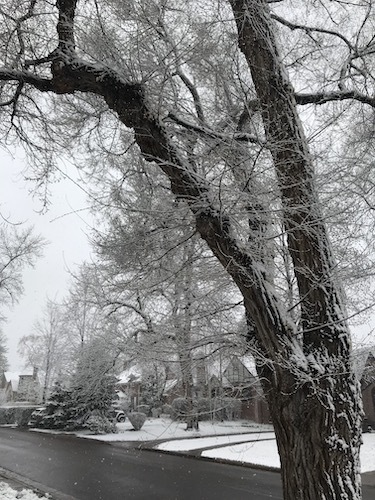 10, 2019 – With high winds and a blizzard warning issued for the Denver metro area, Denver Parks & Recreation is reminding residents how to remove snow and manage fallen trees and branches. Heavy wet snow and strong wind is expected throughout the afternoon and evening. Be aware that accumulating snow, ice, or wind could cause limbs to break and fall at any time. Check to make sure the tree is safe and clear of all utility lines prior to removing snow; DO NOT attempt to shake snow off a tree if a utility line is going through its branches or is within contact distance. If the tree is clear of utility lines, use a broom to remove as much snow as possible from branches by brushing off or gently shaking. Avoid large, rapid movement as this could cause the limb to break. DO NOT attempt to climb tree or use ladder to reach higher limbs. If emergency removal of a fallen tree or tree branch is needed to clear a street, call 311 to report the specific address of the location. The city will evaluate and prioritize the removal of the obstruction, and when necessary, the city will remove the encumbrance, and the cost of the work will be billed to the responsible property owner. Solid Waste Management collects a limited amount of branches as part of its regular extra trash collection service to residents. Branches must be no larger than 4 inches in diameter, and they must be cut into lengths of 4 feet or less, bundled and tied, and weigh no more than 50 pounds. Customers may set out up to 10 bundles of branches on their scheduled every-4-week extra trash collection. Stay clear of downed lines and report them immediately to Xcel Energy at 1-800-895-1999. If a power line is in contact with any object, stay away and call 911 immediately. Anyone who witnesses an emergency situation that requires an immediate response should always call 911.